How would you feel if after waking you up at 7 AM, your alarm clock also turned on the geyser and notified your coffee maker to prepare coffee for you just the way you want it? You know what makes this dreamy morning possible? Yes, Internet of Things! So, what is Internet of Things? In simple words, it is a web-enabled system that works through internet connectivity and by collecting data from your devices. It follows a Machine to Machine (M2M) communication principle and is a highly complex and intelligent system. You know what else it is? It is the future! From Nest thermostats to hue lights and Fitbits to self-driving cars, it’s all the magic of IoT that keeps us enchanted in this Muggle world and will continue to do so. 1. Embedded sensors: These are responsible for collecting data from the devices that you use as well as your environment. These sensors pick up information such a temperature, pressure, sound, and make your internet of things applications function accordingly. 2. IPv6: IPv6 is the communication protocol that enables the working of IoT as well as the creation of new and unique IP addresses. This protocol is secure and allows multiple devices to be connected at once. 3. Cloud: This is a system of digital data storage that documents all the data transmitted from your cellphones, laptops, home appliances, etc. All the information from your device id, sensors, and processors gets stored in a cloud. 4. Data processing: Once the data is stored in the cloud, it goes through processes of manipulation to make meaningful datasets. This is made possible through sophisticated algorithms that you can get familiar with through an IoT training. 5. Connectivity: The IoT applications have the capability to establish both online as well as offline connection. 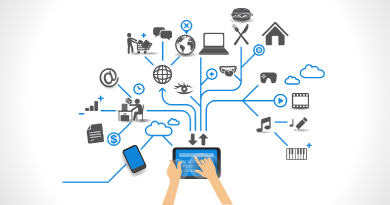 IoT connectivity works on the Point to Point (P2P) principle through the modes of Wi-fi, Bluetooth, Radio-Frequency Identification (RFID), etc. Why should you care about IoT? IoT has the potential to make healthcare and medical facilities better than ever. Just imagine how easy things would be when in cases of emergency, the hospital could extract the patient’s medical records from the cloud and operate accordingly without wasting even a single second. With things like Amazon Echo and Google Home, IoT is already making its way in both outdoor and indoor spaces. Let’s say you forgot to switch off the AC in your room. A few hours later, while sitting in the classroom or watching a movie in the theatre, you suddenly realize that you didn’t switch it off. But you can’t do anything about it until you reach home and then you start worrying about the electricity bill! Guess what, with IoT, all such problems can be solved! Your AC, connected to the internet, will have a short chit-chat with your smartphone informing it about your carelessness. Your phone will then tell you about it and you can switch it off with just a tap! With government programs like Digital India, Smart Cities, and Make in India, the nation is advancing towards deploying IoT solutions. According to a TechSci Research report, IoT market in India, currently in a nascent stage, is projected to grow at a CAGR more than 28% during 2015-2020, which would be about $15Bn. Having realized the potential of this trend, government, startups, and huge companies (including Google) are heading towards the IoT space. It blows your mind, doesn’t it? Lucky for you, the IoT industry is still a growing one and can make use of skilled professionals and enthusiastic individuals who have taken up IoT courses. 1. Cloud engineers: Cloud engineers perform cloud computing which involves providing host services over the internet. Apart from this, the cloud engineers are also responsible for the planning, management, and support of the cloud’s network and system. Cloud engineers need to be familiar with languages such as Python, Java, and Ruby. 2. Data scientists: All the connected devices generate huge volumes of data streams. Data scientists have the responsibility of making meaningful datasets out of the transmitted information from the sensors. They also perform memory management by computing the storage of the cloud and are usually required to be familiar with SQL and Java. 3. Industrial engineers: Managing and programming the hardware is a crucial part of IoT. Industrial engineers are responsible for making M2M happen in IoT projects. This field generally requires a strong quantitative and mechanical aptitude. 4. UI/UX engineers: The UI/UX engineers in IoT aren’t only responsible for the software design but also the hardware to enhance and optimize user’s experience. Additionally, they are also responsible for creating appropriate interfaces. The skills needed in this field include Adobe, CSS, GUI development, etc. What are you waiting for? The Siris, Alexas, and even the Jarvises of the world await your entry into the amazing world of IoT. Take the future into your hands and join Internshala’s IoT training to get an additional discount of 10%. Reliant Institute of Technology is an authorized TEKLA training center of Excellence in Kerala. It is formed by a group of passionate Engineers and respected consultants from the industry. The institute has formulated well-structured training program suited for different industries following international standards to satisfy the technological requirement according to the present demand in the job market.